Below, Chris Gardiner's narrative dungeon-delving game, is now live! I've had a blast playtesting the beta, and am very happy to see it move on to a broader audience. 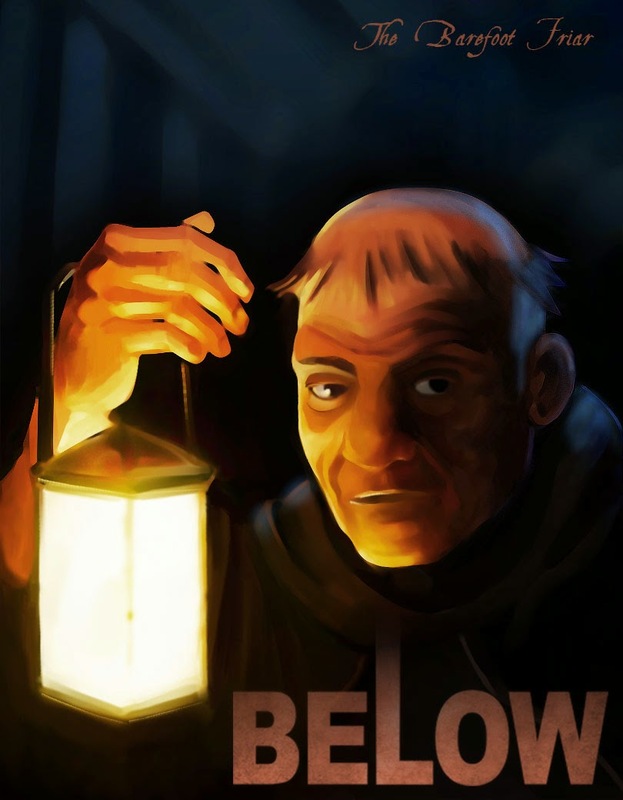 Below combines elements of several disparate genres, but ends up with a unique flavor of its own. It has the semi-random structure and permadeath of a roguelike; it's played in the browser like a casual game; it's text-heavy like a classic adventure game; it has the atmosphere and character-building dynamic of a fantasy roleplaying game. The result is a game that feels a great deal like a folk tale, filled with both abstract, representational elements and very specific moments that strike you with their evocative detail. The mechanics have changed a great deal during the time it's been in beta, with many of my early powergaming techniques being nerfed or obsoleted by later developments. A significant change to Second Chance items was made recently, and I haven't yet adapted my playstyle in response, so I'm probably not the best source for tips. Still, here are some general suggestions I have for new players. Both of the available characters (Barefoot Friar and Blacksmith's Daughter) are of roughly equal utility. The Friar is probably slightly more forgiving for new characters thanks to his Condition-removing ability, while the Smith can be a bit more powerful at endgame. Don't feel like you need to pump up all of your stats. Particularly when starting off, you'll usually need to trade off one for another. Try to pick one or two to focus on, and dump on the remaining one. Whenever you can, try to get heirlooms that will help future characters, or reputations, prestige cards, and items that will carry over to your current character's future quests. In the long run, you'll probably end up with more XP than you can spend, so don't hoard it. You can unlock achievements by dying, or by retiring characters. It makes sense to do this early on with your starter characters, before you have too much invested in them. There's no shame in hanging out on the upper levels of the dungeon. The challenges are much easier here, and the penalties for failure are less. It does mean spending more time acquiring the resources you need, but now that action limits have effectively been removed, there isn't much downside to it. Drop by the Google+ Community to discuss strategy and lore with other players. There's a bunch of other stuff I could say, but I don't want to spoil the fun of figuring it out. Below is challenging, but rewards you for suffering and for figuring things out. Over time you'll gradually come to know the dungeon well and feel more confident navigating through it, but there's never a moment where it becomes safe: the enemies you face can't be beaten back with swords or dispelled with magic, and you'll need to stay cunning and cautious in order to achieve your goals.